Unsurpassed opportunities to witness Africa's un-spoilt wilderness from a range of perspectives with boat excursions along the Rufiji River, enduring hiking and exhilarating fly-camp safari expeditions into the bush; an in-depth insight into an incredible land. The Selous Game Reserve offers a superb African getaway, an un-paralleled experience of untouched Africa. The Selous, at 55000km², is the second biggest conservation area in Africa, and a proclaimed world heritage site. The reserve covers an area twice that of Denmark! A true wilderness with a rich variety of wildlife, it is virtually undiscovered and remains one of Africa's best kept secrets. This wilderness has been largely untouched by human and contains the world's largest concentration of elephants, buffalo, crocodiles, hippos and wild dogs. Other species include lion, giraffe, baboon, zebra and the greater kudu. Over three quarters of a million animals inhabit this great wilderness. 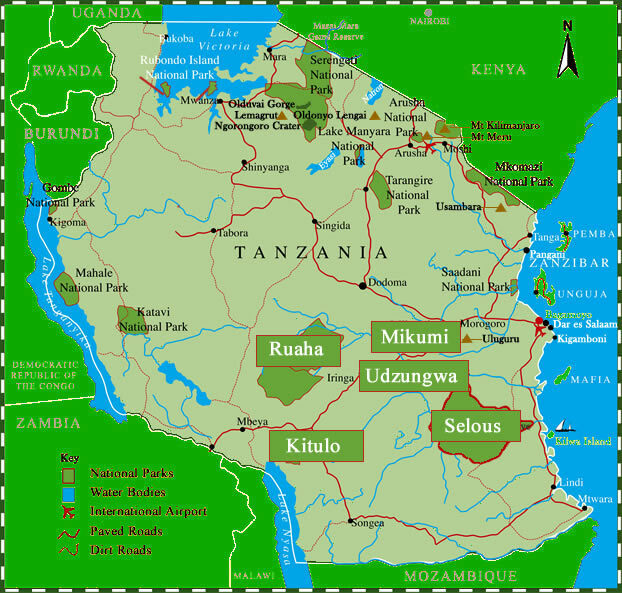 The park is split into two contrasting grounds, the Selous and the Mikumi, by the great Rufiji River. The reserve combines many types of vegetation, from the Beho Beho Mountains to the Rufiji River with lakes, streams and swamps full of buffalo, waterbuck and Borassus palms. Stieglers Gorge, 100m deep and 100m wide, is a magnificent natural feature with a gut-wrenching cable car that ferries safari vehicles across the river. It also happens to be a spot favoured by the leopards. The highlight of a trip to the park has to be the river safari on Lake Tagalala. The area is a fantastic site for spotting lions and elephants as they come to bathe in the lagoons. Watch out for hippos and crocodiles! In the Beho Beho section of the reserve, the hot springs at Maji Moto is a great place to soak away the dust and bruises of overland safari travel. Also in the Beho Beho area is the grave of Captain Frederick Courtenay Selous, the British hunter, soldier, naturalist and great eccentric who gave the reserve its name. The reserve is also a haven for bird lovers; more than 350 species of birds have been identified here including the goliath heron, fish eagle and kingfishers to excite any keen ornithologist.